The National Geographic Channel, Ayala Malls, and The Mind Museum invite the public to catch the final run of the Big Blue Exhibition, an interactive road show that unlocks the secret of the magnificent blue whale, at the Greenbelt 5, Makati City until February 17. The Big Blue Exhibition aims to promote marine conservation by sharing a number of new scientific discoveries about the world’s largest mammal while highlighting human threats to the species. 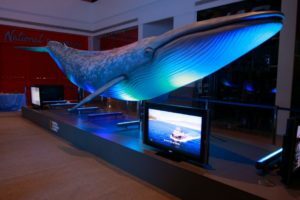 This innovative exhibition tells the blue whale story through a sophisticated sculpture of a life-like blue whale calf and breathtaking footage from NGC documentary, Big Blue. The sculpture is a life-sized model of a nine-meter long, two-month old, female blue whale which was created by a team of professional model makers in Australia. The highlight of the exhibition, it is the biggest baby blue whale sculpture ever made. The Big Blue Exhibition also features expert sharing session, and interview with local marine scientists arranged by The Mind Museum. For its last run, SkyCable subscribers can also send what they learned along with their photos from the exhibit for a chance to win exclusive prizes from National Geographic Channel or a whale-watching trip to Donsol, Sorsogon for a family of four. The whole family can also learn more about the blue whale through footage from the Big Blue documentary. The special features never-before-seen moments in the life of blue whales, with stunning first-time footage of a blue whale calf and its mother and amazing shots of an adult blue whale singing. Audiences also get a unique whale’s view through an advanced technology developed by National Geographic called CRITTERCAM®, which allows unprecedented access into the animal kingdom without human interference. This state-of-the-art research device was attached to a blue whale’s back to record footages of the animal as it travels deep into the ocean to allow scientists to study its behaviors. The Big Blue Exhibition is brought to the Philippines by the National Geographic Channel in partnership with The Mind Museum and Ayala Malls. It has toured five Ayala malls since it was launched November last year, and will be mounted for the last time at the Greenbelt 5, Makati City until February 17. This is its last stop from an Asian tour that aims to raise public understanding of the blue whale. The exhibition has been to Singapore, Malaysia, Taiwan, and Hong Kong.